Trapezium is a geometrical figure with four angles, two sides of which are parallel to each other and called bases, while the other two are not parallel are called lateral. Consider two tasks with different initial data.Task 1.Find the lateral side of the isosceles trapezoidif you know the base BC = b, the base AD = d and the angle at the side of the BAD = alpha.Solution:Drop a perpendicular (the height of the trapezoid) from the vertex B to the intersection with the large basism, will receive a cut BE. Write down the formula for AB using the measure of the angle: AB = AE/cos(BAD) = AE/cos(alpha). Find the AE. It would be the difference of the lengths of the two bases, divided in half. So: AE = (AD - BC)/2 = (d - b)/2.Now find AB = (d - b)/(2*cos(alpha)).In an isosceles trapezoid the lengths of the sides are equal, hence CD = AB = (d - b)/(2*cos(alpha)). Task 2.Find the lateral side of the trapezoid AB, if you know the upper base BC = b; lower base AD = d; the height BE = h and the angle opposite the side of the CDA is equal to alpha.Solution:do a second height from vertex C to the intersection with the lower basisof m, will receive a cut of CF. Consider the right triangle CDF, find the direction FD according to the following formula: FD = CD*cos(CDA). The length of the side CD, find another formula: CD = CF/sin(CDA). So: FD = CF*cos(CDA)/sin(CDA). CF = BE = h, therefore, FD = h*cos(alpha)/sin(alpha) = h*ctg(alpha). Consider the right triangle ABE. Knowing the length of sides AE and be, you can find the third side - the hypotenuse AB. 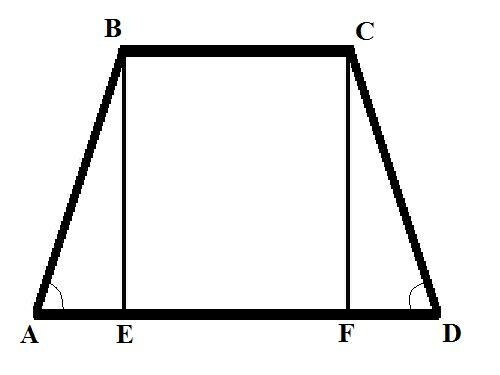 You are aware of the length of the side BE find AE as follows: AE = AD - BC - FD = d - b - h*ctg(alpha).Using the following property of a right triangle - the square of the hypotenuse is equal to the sum of the squares of two - way AB:AB(2) = h(2) + (d - b - h*ctg(alpha))(2).The lateral sides of the trapezoid AB is the square root of the expression on the right side of the equality.